Organizing group travel in the Big Easy sometime soon? 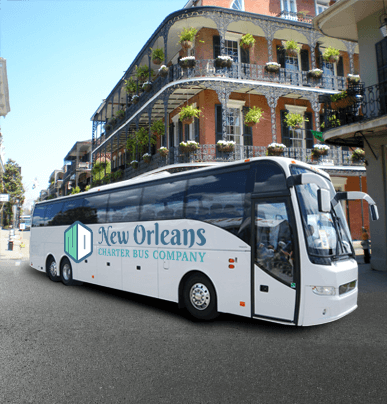 With access to thousands of the best buses on the market, New Orleans Charter Bus Company is the premier charter bus, minibus, and airport/wedding shuttle rental service in the area. Trust us to find a coach bus suited to your needs, no matter your requests. Choose the road to glory with one of the spacious full-sized buses we charter. These sleek vehicles include storage galore for sports equipment. No cross-state tournament is too far, especially with options to add reclining seats and TV monitors. With these premium features, your team can enjoy a stress-free pregame situation. Expedite your wedding planning with a savvy investment: elegant wedding shuttles for your guests! Family and friends who travel to New Orleans for your nuptials will be overjoyed at the thoughtful detail, and you’ll get to enjoy a smooth wedding day—just the way it should be. You can expect your driver to be serially punctual and your bus to be stylish and safe. Show important clients and business colleagues around New Orleans with a clean, professional airport shuttle to pick them up and transport them around town. For meetings, lunches, and team outings, a minibus rental by New Orleans Charter Bus will impress even the pickiest guests. We take school travel very seriously—your students will be in safe hands with New Orleans Charter Bus. With top-of-the-line charter buses and drivers in our network, reliability comes naturally. We’ve worked with a wide range of companies, from startups and nonprofits to Fortune 500s, to provide the easiest, most reliable group transportation. 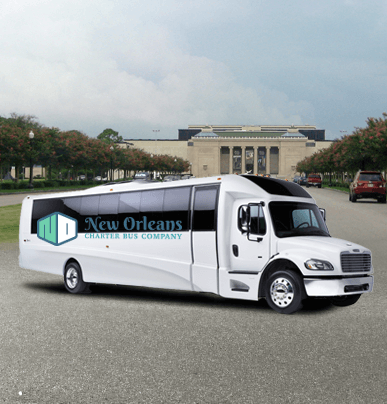 Our expertise, large network of bus rentals, and 24/7 customer support has made us the top choice for streamlined charter bus rentals in New Orleans. “I’m so glad I booked these guys. From start to finish, the process was super smooth. I never worried that I made the wrong decision. Will definitely book again for any event! “Loved being able to make the shuttle more luxurious. Clients enjoyed it! Thanks." Long road trips are best enjoyed from the passenger seat, staring out the window at passing landscapes. For your far-away travels—whether for a sports championship, educational trip, church trip, or any other occasion—the roomy 56-passenger buses in our network make the journey smoother and more comfortable. Zip around New Orleans’ traffic and tight street corners with the efficient minibuses available through our network. These small buses, ranging from 18 to 25 passengers, are very versatile—book one as a wedding or airport shuttle, a church outing vehicle, or a corporate-approved vehicle rental, complete with a personal driver. 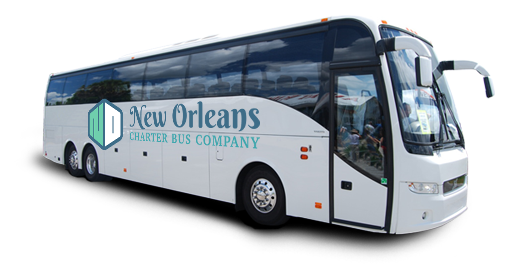 You can’t go wrong when renting a compact minibus from New Orleans Charter Bus.